The actual vistas from windows and patio decks at this factory-turned-apartment complex are unique, for Terre Haute. A train rolled over a trestle bridge, across the Wabash River and into the chilly city Monday afternoon. That was the view from the porch outside a one-bedroom unit nicknamed “the penthouse.” From a kitchen window on the Riverfront Lofts’ south side, the Vigo County Courthouse, the 12-story Sycamore Building and the river dominate the scenery. Eastside apartments face Indiana State University’s Gibson Track and Field Complex and the campus in the distance. The riverfront’s future horizons look interesting, too, now that the transformation of an 87-year-old, abandoned manufacturing plant is nearing completion. The hulking white concrete structure was built in 1931, at the onset of the Great Depression, to house the American Can Co. Through decades hundreds of workers earned a living there for American Can through the late 1950s and Pillsbury from 1995 to ’90, before it became a storage facility for ICON Trucking through the early 2000s. ISU bought the grounds in 2009. On Aug. 1, the first occupants of the 168-unit Riverfront Lofts will move in. Indianapolis-based Core Redevelopment invested $20 million into the private-public project, along with $4.7 million in Indiana Economic Development Corp. tax credits and tax increment financing allocated by the City of Terre Haute. Thirty units have already been leased. Construction on the third floor is almost done, with the second and first floors progressing toward the summertime target opening. Mechelle Padgett, the building manager of Riverfront Lofts, looks out over the Wabash River from a second-story apartment. It adds residential living to the east bank of the Wabash — a goal envisioned for more than a decade by Riverscape, a nonprofit group working to enhance the long-neglected waterway. “I’m super excited to see in a year, five years, 10 years, what that place around there turns out to be,” said Maggie Mallory, who handles marketing for Core. Nearby amenities already include the ISU track complex, a $4.3 million facility that opened in 2014, along with Imperial Lanes bowling alley and gas stations a few blocks east. The addition of apartments overlooking the Wabash could inspire new businesses and startups to locate near the residences. Those, said Shelley Klingerman, executive director of Launch Terre Haute, could include a small grocery store or pharmacy, a dock bar, water sports rentals (such as kayaks, canoes, pontoon rides or party barges), food trucks parked on the riverfront on Fridays or during festivals and special events, casual waterfront restaurants and pubs or coffeehouses. Launch, a downtown collaborative work space for entrepreneurs, includes “a lot of creative, visionary people” that could pursue such concepts. The transformation of the old factory has been dramatic, as well. Reactions from former employees of Pillsbury, which made food products such as cake and gravy mixes, impressed Eric Seal, a developer for Core. Seal gave tours last week to those retired Pillsbury workers. On the banks of the Wabash: Riverfront Lofts, which is being transformed from the former American Can/Pillsbury/ICON building into a unique living space, offers this northern view of the Wabash River and a railroad bridge. “They were just shocked and amazed that it was saved … and happy,” Seal said. Elements of the structure, preserved in the conversion, keep it recognizable to longtime Hauteans. Its design fits an industrial version of art deco, though that distinction probably sounds a bit highfalutin to the hundreds of workers who toiled inside its 15- to 18-inch thick concrete walls. Core adapted the apartments’ configurations around the 186,000-square-foot building’s quirky features. Such flexible vision is routine for Core, the company that turned Indianapolis’ vacant and antiquated Bush Stadium — also built in 1931 — into the present Stadium Lofts. The minor league Indianapolis Indians once played in that stadium on 16th Street in Indy. So, when Core crews began carving out the center of the factory — from its rooftop to the ground floor — to create a spectacular exposed atrium and realized the concrete floors and supports were immensely thick and replete with rebar, they brainstormed and kept going. “You’re kind of wed to doing that,” Seal said. As diamond-blade saws began cutting, the concrete’s weight caused it to rip, rather than neatly slice apart. Chunks tumbled one and two stories downward. Preliminary cuts to each section helped steady the process. The end result will be a cathedral-sized atrium in the heart of the Lofts complex, with landscaping at its base, apartments on the left and right — and the open sky above. They also discovered a slope in the first floor of the 300-foot-long building. The slope was gradual, but totals 30 inches from north to south. “It sloped enough that doors wouldn’t be lined up with each other. You would’ve had things rolling. It wouldn’t work. You would notice,” Seal said. They poured new concrete to level the slope, which was originally used so American Can workers could easily push large rolls of metal. “It’s about as tank-like as you can build it,” he added. Hefty concrete pillars supporting its weight were exposed in the apartments, along with some brick walls. The sawtooth roof — unusual because of its all-concrete design — creates tall, angular ceilings in the third-floor units. Of course, land along the river banks existed before 1931. Its occupants included a hominy plant, a pork packing factory, a grain mill and Native Americans, such as the Wea tribe. When Core did limited digging to attach sewer lines, a human skull was unearthed. Police concluded the remains were likely part of the Indian Orchard Cemetery, Terre Haute’s oldest burial ground. Seal said the Indiana Department of Natural Resources helped Core handle the situation, and no further digging occurred. Life after manufacturing exists for Terre Haute’s old factories and businesses, as the Riverfront Lofts project confirms, said Tommy Kleckner, director of the preservationist Indiana Landmarks’ western office. “Core Redevelopment’s investment in the old American Can Co. building speaks to the economic value and potential of historic industrial or utilitarian structures,” Kleckner said. Riverfront Lofts will have a floor-to-roof atrium. The apartment building on North First Street is scheduled to open Aug. 1. Nation also sees fiscal benefits. “These projects go back on the property rolls, which is good for the future,” he said. The North First Street area is one of three focuses of Riverscape, along the west-bank Wabashiki wetlands and the southside industrial corridor. Plans continue for recreation, extensions of the National Road Heritage Trail, and the Turn to the River project to connect downtown to the riverfront. 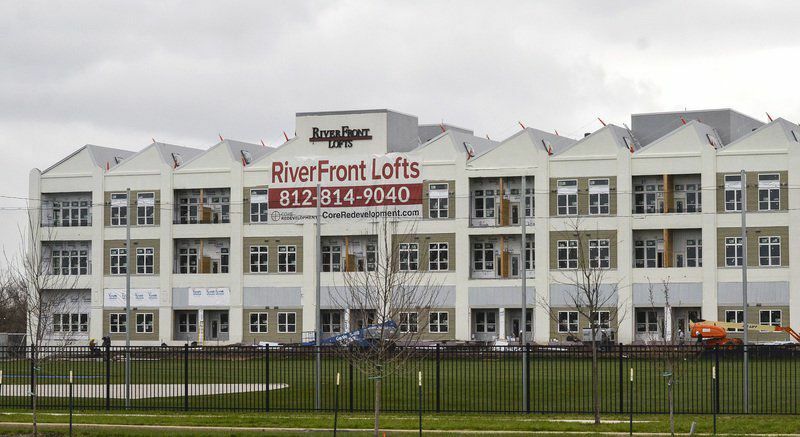 For now, the first 30 renters of Riverfront Lofts units represent a “really diverse mix” of people, said Core property manager Mechelle Padgett. Retirees, downsizing empty-nesters, young professionals and couples are part of the initial influx. They’ll pay between $649 and $1,649 a month for one-, two- or three-bedroom units, which range in size from 520 to 1,600 square feet each. Padgett, who also manages another Core makeover project, The Deming (a college student-oriented complex at Sixth and Cherry streets), is impressed to watch an eyesore abandoned factory become a catalyst for greater accessibility to the community’s most famous natural resource. “The goal is to give the Wabash River, which had such a bad stigma, a new” image, she said.